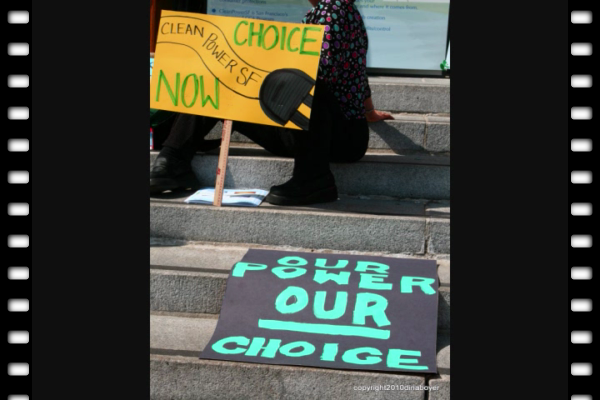 On Tuesday March 23rd some San Francisco Board of Supervisors, community groups and local residents held a press conference on the steps of City Hall to denounce the lies and manipulations put-on Pacific Gas and Electric' mailers and television commercials over Proposition 16. Supervisors also took this time to re-iterate their commitment to Clean Power SF, which is a plan adopted in 2007 that will set San Francisco on the path to using clean renewable energy from cheaper sources. "We are committed to Clean Power SF"
"I don't give a f_ck about PG&E, we are committed to Clean Power SF."